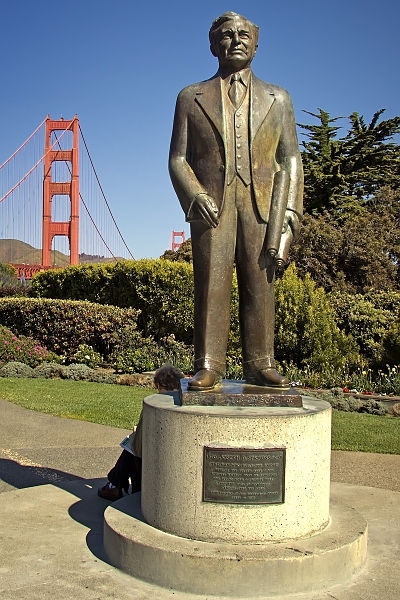 Joseph Strauss, a Cincinnati native, was a noted civil engineer who in 1937 helped design the Golden Gate Bridge in San Francisco. The Golden Gate is a wonderful example of Art Deco design that spans a submerged cleft in the Coastal Mountain Range called the Golden Gate. It is almost 9,000 feet long (about 2 miles) and joins north San Francisco and Sausalito, California. There were many challenges to bridge designers: rough ocean waters, high winds, the width of the waterway, and the huge expense. Plans for a bridge to span the waterway began in 1916. For the next 15+ years the bridge underwent many design changes on paper. In 1929 Joseph Strauss was appointed as Chief Engineer; he budgeted construction at about $27,165,000. At the time it was the largest suspension bridge on the globe. The Golden Gate Bridge is the result of the joint effort of Joseph Strauss, Clifford Paine, engineer Charles A. Ellis, and consulting architect Irving F. Morrow. The bridge was paid for by San Francisco and five north coastal California counties. Construction was relatively speedy, taking only 52 months to complete. It opened May 27, 1937, at a cost of $27,125,000 - under budget. Strauss was also a pioneer in building safety. He required workers to wear hard hats (an innovation at the time) and undergo daily sobriety tests. While the original plans for the construction of the Golden Gate Bridge recommended destruction of Fort Point, a civil war-era brick structure, Joseph Strauss insisted on saving the building and designed around it. In doing so, a large portion of the cliff behind the fort was removed, and the cables were anchored there. The fort was used as base offices for construction, and then the building was preserved and today is a popular tourist attraction, and became a National Historic Site on October 16th, 1970.